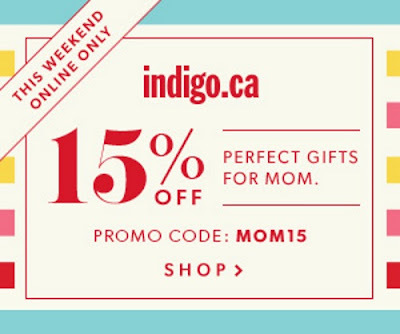 Chapters Indigo is offering 15% off the perfect gifts for mom this weekend! This applies to regularly priced decor, style and more online! Offer is valid until 3am ET on May 9, 2016. Offer excludes books, sale items, all electronics and accessories (including Apple and Kobo), LEGO products, American Girl products, Kate Spade New York products, Rosetta Stone products, Love of Reading Donations and gift cards. Enter the promo code MOM15 at checkout to get this offer. Click here to browse Chapters Indigo.